Why does TMWA have an assigned-day watering plan? In short, it’s because our community values responsible water use. Water in the Truckee Meadows is a limited and valuable resource. By watering responsibly, you’re helping to ensure there’s a plentiful water supply for future generations. 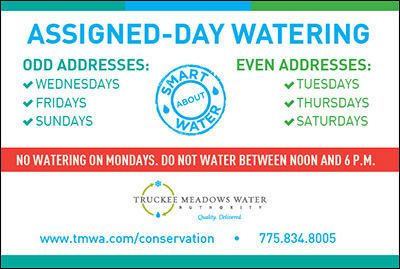 Whether it’s raining in June or dry in December, TMWA always values responsible water use. That’s why we encourage responsible water use. We’re experts on efficient watering, and we’re here to help you make smarter watering choices. The idea is to work with Mother Nature as closely as possible, watering your yard only when it needs to be watered, while avoiding waste. Running your sprinklers every other day under the assigned-day watering schedule is the best way to keep your yard healthy while keeping your water bill low. Assigned-day watering only applies to your sprinklers. Run them when it is cool, usually early in the morning, and try to avoid watering when it is windy. Be sure to turn your sprinklers off when it’s raining, and let Mother Nature take care of the watering for you. Even (0, 2, 4, 6 or 8), you may run the sprinklers on Tuesdays, Thursdays and Saturdays. Odd (1, 3, 5, 7 or 9), you may run the sprinklers on Wednesdays, Fridays and Sundays. Watering Times: Normally, we ask that you shut your sprinklers off between noon and 6 p.m. from Memorial Day through Labor Day to conserve water. Also, give your sprinklers a rest on Mondays, as this is a day we replenish our water system. Drip systems and hand watering of trees, shrubs, flower beds and vegetable gardens are permitted any day of the week; but please keep it mind to use an automatic shut-off nozzle when using your hose. Outdoor watering increases water use of the average residential customer by up to 10 times during the dry summer months. Beyond the clear conservation benefit, assigned-day watering also helps to level off peak usage during the high-demand season. On your assigned watering days, water your yard until puddles begin to form, then stop and wait for the it to soak in (about 1-2 hours). Repeat this process until water penetrates 6-8 inches deep, which can be determined by easily pushing a screwdriver into the damp soil. Hand watering or running drip systems to irrigate flowerbeds, vegetable gardens, trees and shrubs is permitted any day of the week. Need Help with Your Irrigation Controller? Below we have provided links to several of the most common manufacture’s online irrigation-controller manuals.